Wang Qishan’s conversation with foreign experts reveals a lot about the governing strategies of China’s current leaders. On April 23, Wang Qishan, the head of China’s anti-corruption agency, met with three scholars in Zhongnanhai – renowned political scientist Francis Fukuyama, former Citic Securities manager Tatsuhito Tokuchi, and economist Masahiko Aoki. Wang’s remarks, given in a forceful and unconstrained style, revealed much about how the current Chinese administration views governance. Below, I excerpt some passages from Wang’s remarks and add my own comments. Speaking of the concepts of the nation, the rule of law, and accountability, these three elements are part of China’s historical “DNA,” meaning that Chinese culture has this DNA. First, we need to clarify our own history and civilization – this excellent DNA should play a role in China’s modernization… And the Chinese nation needs to absorb the good aspects of Western culture. China should absorb the admirable pieces of every nation in the world. While sticking to the policy of “opening up,” China’s conservatives have been putting out obvious signals of a desire to return to traditional Chinese culture. Although the idea of seeking the “DNA” of modern civilization from Chinese traditional culture (including the teachings of Confucius and Mencius) is certain to excite some, I doubt this movement has much of a future. I agree with Wang that China should both absorb the positives from foreign cultures and explore the excellence of our own traditional culture. I’ve previously written about similar topics. In one article I discussed the “late-mover advantage” and “late-mover disadvantage” for nations pursuing democracy. The advantage: countries today don’t need to fight a bloody war to invent democracy, since other countries have already developed various models (the three original democratic states – the U.K., France and America — founded their own democratic systems only after wars). The disadvantage is that countries may be tempted to simply copy the results of a democratic system without undergoing the process of democracy-building, which is what truly enables mature democracies to last for hundreds of years. Thus the non-Western states who copy the trappings of democracy fail to achieve what they set out to do. Wang is very clear-headed about this point. It is absolutely impossible for any country – let along a giant country like China – to completely abandon its past even while chasing modernity. If we break from the Chinese tradition and culture, then we are heading for dangerous ground. However, as Wang said, “The Americans who drew up the constitution were very clever.” They not only protected their own benefits but also created a stable and harmonious state. Do those drawing up China’s constitution and leading China into the future have the same intelligence and wisdom as the American founding fathers? Or will they resist modernization and institutional transformation for their own benefit – and thus end in tragedy – like so many Chinese rulers in history? For a long-serving ruling party, there’s immense pressure to self-supervise and self-purify. And we have realized that this is just the beginning… It is really difficult for someone to supervise himself. I have also been considering this problem. In the field of medicine, there is only one example of a doctor operating on himself, which you can look up on the Internet: a surgeon in Siberia removed his own appendix. This is the only example, which suggests how difficult it is to conduct self-renewal and self-purification. 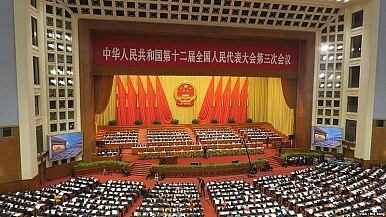 Wang has previously said that anti-corruption in China is akin to “scraping poison off the bone” for the Party. But here he noted that there’s only one case of a patient performing surgery on himself. At present, corruption in China is more like a serious tumor and cancer instead of a mere “appendix” problem. Can Wang really operate on himself? The judicial system must move forward under the leadership of the Party. This is a Chinese characteristic. The idea of using Chinese teachings as the spirit and Western teachings as the tool will not work. China has all the basic elements of human culture – how can we expand the best parts? When it comes to the most basic values, we’re the same – otherwise how could we talk to each other? For the first time, Wang explicitly said that China’s “basic values” are the same as those of other world nations. That means that “shared values” do exist in the world. And to my understanding, “shared values” are those values universally used by each country. This is very important. Some people may believe that Wang is advocating for China to return to traditional culture to find consolation and solutions. But while Wang emphasized traditional culture, what he meant was that we should look for some shared values in tradition – the “DNA” of modern civilization. He didn’t mean that we should return to tradition, seeking specifically to find elements that challenge modern civilization.